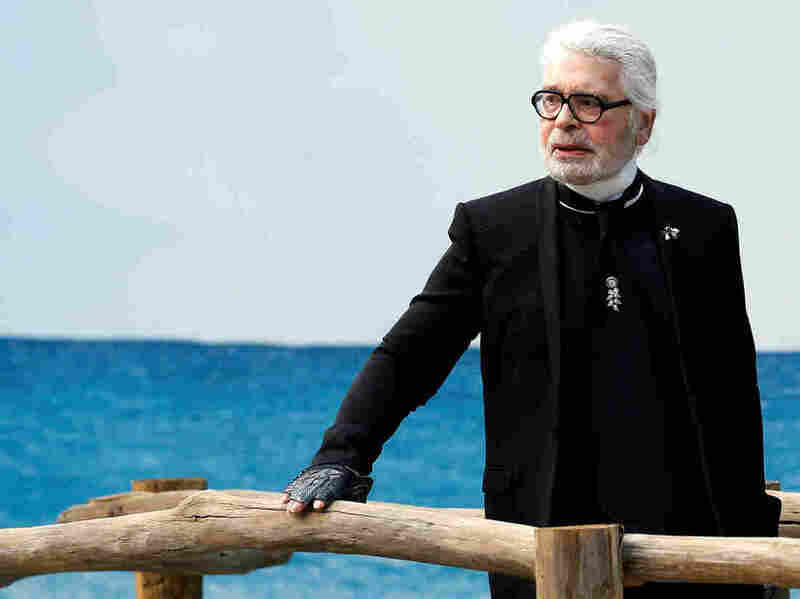 Karl Lagerfeld Dies; A High Priest Of High Fashion Karl Lagerfeld brought Fendi to new heights in the 1960s and revamped Chanel in the 1980s. He also was famous for his wit — and had a knack for making outrageous comments. German designer Karl Lagerfeld died in Paris, according to fashion house LVMH, owner of Fendi. He is seen here at the end of Chanel's 2019 women's ready-to-wear show in Paris, where a beach was created to show off Lagerfeld's collection. Chanel announced the designer's death Tuesday, less than a month after he uncharacteristically missed shows for the fashion house, prompting questions about his health. As news of his death spread, Lagerfeld's peers in the fashion industry quickly paid tribute to a figure who was at once immediately recognizable and endlessly enigmatic. "Karl your genius touched the lives of so many, especially Gianni and I," said Donatella Versace on Instagram. "We will never forget your incredible talent and endless inspiration. We were always learning from you." "With the passing of Karl Lagerfeld we have lost a creative genius who helped to make Paris the fashion capital of the world and Fendi one of the most innovative Italian houses," said Bernard Arnault, chairman and CEO of Fendi owner LVMH. "We owe him a great deal: his taste and talent were the most exceptional I have ever known." "For instance, a daysuit ... with a typical Chanel cardigan jacket, outlined at the neck and waistline, of wool boucle in ivory and beige, with shots of coral. The lining is silk. The real Lagerfeld part: the illusion of unraveling wool, laced with color, at the skirt and cuffs." 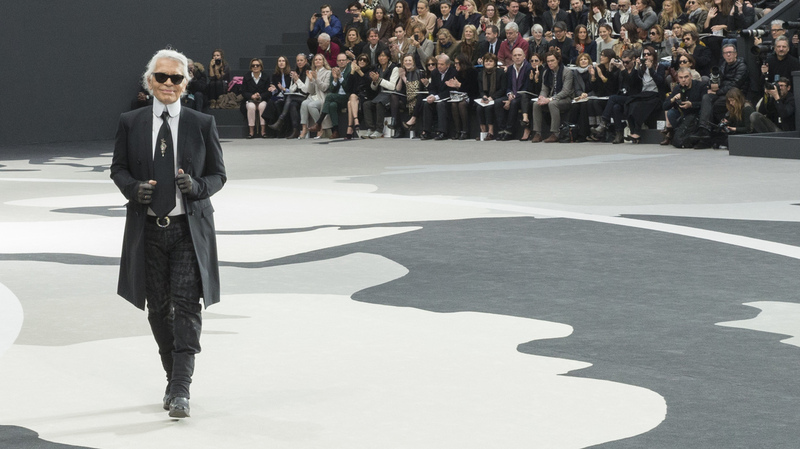 Lagerfeld acknowledges applause following a Chanel show in Paris in 2013. With his trademark ponytail and dark glasses, Lagerfeld was a fixture in the world's art hubs, fashion's high priest in a tailored black jacket. He once called his glasses "my burka" and referred to his public image as a mask, a caricature of himself that he embraced. He also was famous for speaking his mind, with a quick wit and a knack for making outrageous comments. "Life is not a beauty contest, some [ugly people] are great," Lagerfeld once said. "What I hate is nasty, ugly people ... the worst is ugly, short men. Women can be short, but for men it is impossible. It is something that they will not forgive in life ... they are mean and they want to kill you." On more practical matters, Lagerfeld called the garbage can the most important thing in a house. The designer also condemned a common piece of clothing by linking it with an existential calamity: "Sweatpants are a sign of defeat. You lost control of your life so you bought some sweatpants." Lagerfeld often spoke about women's weight and appearance, and he gravitated toward beautiful models and actresses, from Kate Moss to Kristen Stewart. But he was sharply criticized last year over comments that chided models as well as the Me Too movement — "I'm fed up with it," he said, in an interview in which he said models who don't want to be touched should join a nunnery. In response, the Model Alliance issued a statement saying in part, "Times have changed — and, with it, fashion's moral standing and accountability must as well." Lagerfeld with models Cindy Crawford, Helena Christensen and Claudia Schiffer at a Chanel show in 1993. A contemporary and friend of both Yves Saint Laurent and Andy Warhol, Lagerfeld was prolific in the design world and active on the business front, selling his namesake label to Tommy Hilfiger in 2004. He also forged partnerships with H&M and Macy's, in a bid to further his reach beyond high-end fashion. Lagerfeld's celebrity also extended into films, from Pedro Almodovar's High Heels in 1991 to Julie Delpy's Lolo in 2016. While he created a personal empire in the world of luxury and couture, Lagerfeld occasionally was upbraided for living a profligate lifestyle, amassing art and furniture and seemingly using his personal life to mirror the spectacles he created for fashion houses. Lagerfeld dismissed criticisms of his spending habits, saying, "If you throw money out of the window, throw it out with joy. Don't say: 'One shouldn't do that' — that is bourgeois."